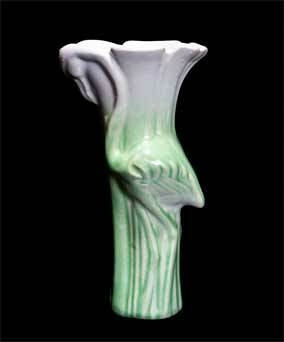 Sunset flamingo vase - 7½" (190 mm) high. Sunset Ceramics was formed in the late 1970s when the two ranges of Celtic Pottery, Folk and Medallion, had lost their appeal. Maggie Fisher made slip-cast ornaments, usually very stylized and often a little quirky. The pottery lasted only a few years, and the items have in recent years become highly sought-after by collectors.